64856, Used Rims, 16X7, 5 LUG, 114mm, 03-04, MAZDA, 6, 55mm OFFSET, SILVER, 5 SPOKE, ALLOY. 64874a, Used Rims, 17X7, 5 LUG, 114mm, 05-08, MAZDA, 6, 5 ANGLED SPOKE, 60mm OFFSET, SILVER, ALLOY. MAY ALSO COME IN CHROME. Price: ORDER UNDER 64857 RIM. 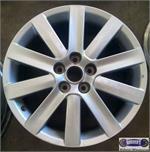 64874a, Used Rims, 17X7, 5 LUG, 114mm, 05-08, MAZDA, 6, 5 ANGLED SPOKE, 60mm OFFSET, SILVER, ALLOY. MAY COME IN CHROME ALSO. ALSO THE SAME RIM AS 64857. 64896, USED RIM, 18X7, 5 LUG, 114MM, 07-09, MAZDA, 3, ALUM SILVER 10 SPOKE. 72684, USED RIM, 16X6, 4 LUG, 114.3 mm - 4.50", 04, SUZUKI, VERONA, ALUM, 5 SPOKE, GROVE IN EACH SPOKE.